This year our school decided to turn it on it's head. We created CapCon! 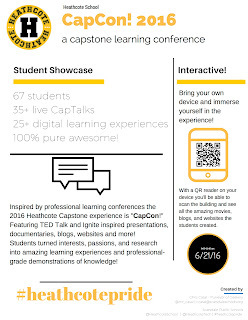 a capstone learning conference. The vision was to create a professional learning conference experience driven by students, their research, and their work. We spoke a lot about Ignite talks, TED Talks, professional quality documentaries (we used 60 Minutes and Real Sports as reference points). 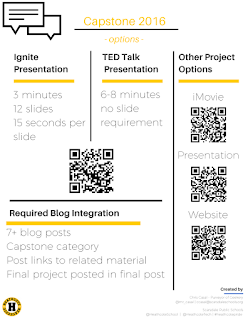 We created flyers, posters, and all the traditional marketing material associated with conferences like ISTE, ASCD, FETC. We wanted our students to create professional-quality research projects, so we treated them as professionals. Professional learners, creators, makers, and presenters. And the students were amazing! First and foremost the 5th grade teachers were onboard and instrumental in preparing the students for the new format. Our Principal was consulted and she was behind us 100%. The 5th grade team; Christine Boyer, Ashley Cooper, and Cristal Edwards were amazing in preparing their students as well as serving as mentors throughout the process. Maria Stile, our Principal, was an amazing support and champion. We were doing something vastly different than previous years. It was a huge leap of faith. It would never have been as successful as it was had it not been the confidence and support of the 5th grade team, administrators, and school as a whole. Not every student wanted to do a live talk and that was great. 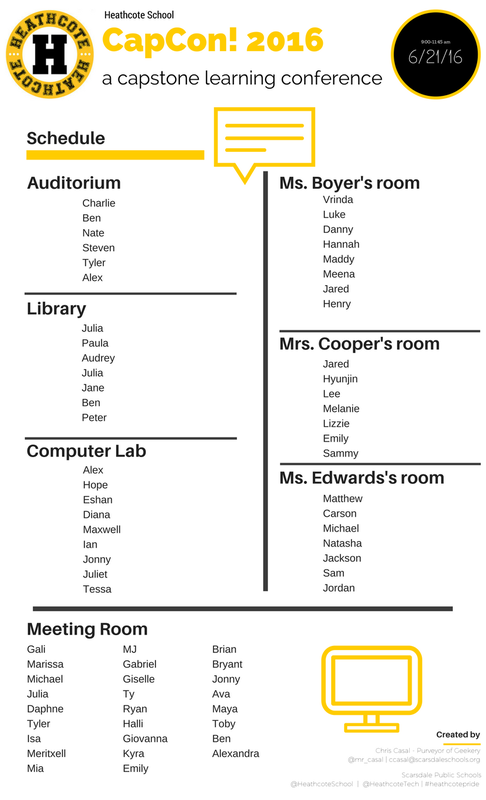 By giving students a variety of options they were able to decide the best path for them. By not having everyone do the same final project, like with the tri-fold boards, every student had the opportunity to truly customize their project. As we got closer to the live event we officially ditched the name "Capstone" and came up with the new moniker. 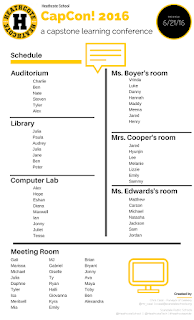 The name that would more accurately reflect what the students were doing and how they would be presenting their information. CapCon! was officially born. 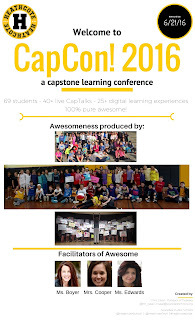 On the day of the event, June 21st, we welcomed parents to CapCon! CapCon! wasn't a tri-fold museum walk. CapCon! was a professional learning conference, driven by students. CapCon! was amazing. The students floored me with their commitment to their projects, to their willingness to step out of their comfort zones, to give speeches, to fine-tune projects with detail and precision, to so wholly commit themselves to their process and product. I was humbled by their efforts and impressed by their results.